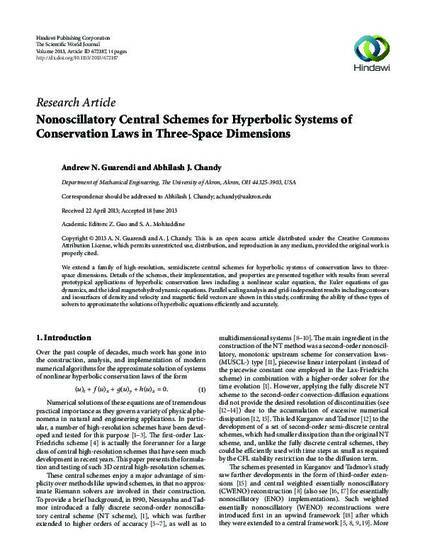 We extend a family of high-resolution, semidiscrete central schemes for hyperbolic systems of conservation laws to three-space dimensions. Details of the schemes, their implementation, and properties are presented together with results from several prototypical applications of hyperbolic conservation laws including a nonlinear scalar equation, the Euler equations of gas dynamics, and the ideal magnetohydrodynamic equations. Parallel scaling analysis and grid-independent results including contours and isosurfaces of density and velocity and magnetic field vectors are shown in this study, confirming the ability of these types of solvers to approximate the solutions of hyperbolic equations efficiently and accurately.